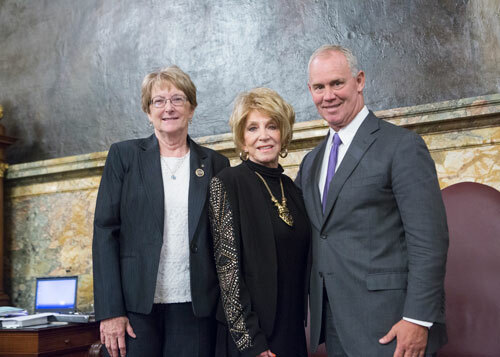 Rep. Kathy Rapp (R-Warren/Crawford/Forest) and Speaker of the House Mike Turzai (R-Allegheny) had the privilege of welcoming Crawford County native and Grammy award-winning American country recording artist Jeannie Seely to the floor of the Pennsylvania House. On Tuesday, the House unanimously approved Rapp’s resolution honoring Seely for her 50th anniversary of becoming a member of the world famous Grand Ole Opry. HARRISBURG – With the Grammy award-winning American country recording artist known as Miss Country Soul in attendance, the Pennsylvania House of Representatives today unanimously approved House Resolution 259 honoring Jeannie Seely on her 50th anniversary of becoming a member of the Grand Ole Opry. The resolution was sponsored by Rep. Kathy Rapp (R-Warren/Crawford/Forest). Born in Titusville, Crawford County, and raised on a farm outside Townville, Seely became the first Pennsylvania native to become an Opry member on Sept. 16, 1967, and also the first woman to regularly host Opry segments. Seely is best known for her 1966 Grammy award-winning country hit Don’t Touch Me, which peaked at No. 1 on the Record World and Cash Box country singles charts, and at No. 2 on Billboard. On Jan. 13, 2017, Seely released her 16th album, titled Written in Song, which has been chosen as one of the most anticipated albums of the year by both CMT.com and The Boot.